The R-PLEX Human HSP70 Antibody Set includes a matched capture and detection antibody pair and calibrator for the quick and easy measurement of HSP70 in biological samples. R-PLEX products leverage MSD’s electrochemiluminescence technology for better sensitivity and a larger dynamic range than traditional ELISAs. R-PLEX matched antibody sets enable the development of singleplex and multiplex immunoassays. Individual assays may be developed using MSD avidin- or streptavidin-coated plates. Custom multiplex assays with any combination of R-PLEX analytes, as well as R-PLEX plus U-PLEX analytes, can be developed on U-PLEX MULTI-SPOT plates. To learn more about the advantages of R-PLEX products click here. 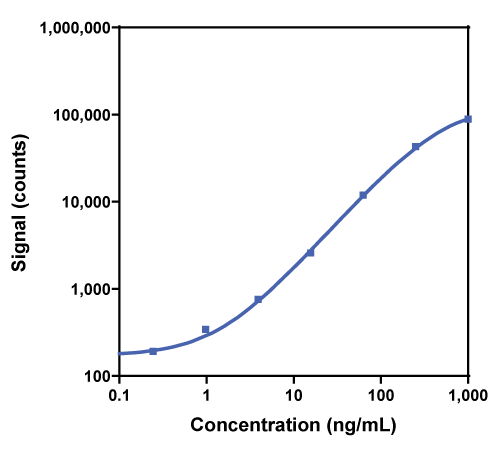 Calibration curve for the R-PLEX Human HSP70 Antibody Set was assessed and representative data are presented below. Description - Heat Shock 70 kDa Proteins (HSP70) are a family of proteins that function as molecular chaperones. HSP70s assist in polypeptide stabilization, aid in transport, prevent aggregation, assist in defective protein degradation, and play a role in inhibiting apoptosis. High levels of HSP70 have been associated with negative outcomes in some cancers. HSP70s may play a role in Alzheimer's disease since aggregated proteins are characteristic of neurodegenerative diseases. Brain-permeable small-molecule inhibitors of Hsp90 prevent alpha-synuclein oligomer formation and rescue alpha-synuclein-induced toxicity. Circulating heat shock protein 70 and progression in patients with chronic myeloid leukemia.